Login to your Mondovo account and select Keyword Research (under SEO Tools) from the left menu. In case you’re a new user, you can create a new Mondovo account in less than 2 mins. 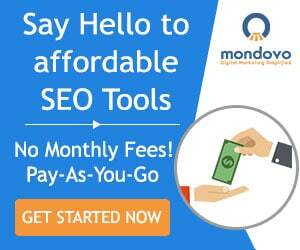 Login to your Mondovo account and select Website Audit (under SEO Tools) from the left menu. In case you’re a new user, you can create a new Mondovo account in less than 2 mins. Summarizing key metrics about your page, like the title/meta description etc. Checks for how the page fares against 25 rules: Over optimization of title tags, meta description presence, page load speed or image optimization check etc. You can see more of these details in the report that you will ultimately run. Steps 1-4 are common throughout irrespective of whether you’re analyzing your home page/inner pages/your page + your competitors’. Login to your Mondovo account and select On-Page Analyzer (under SEO Tools) from the left menu. In case you’re a new user, you can create a new Mondovo account in less than 2 minutes.